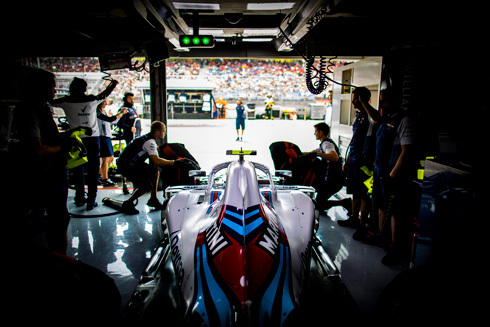 The opening Friday practice session for the 2018 Hungarian GP would see a mixed result for the Williams Martini teaam. 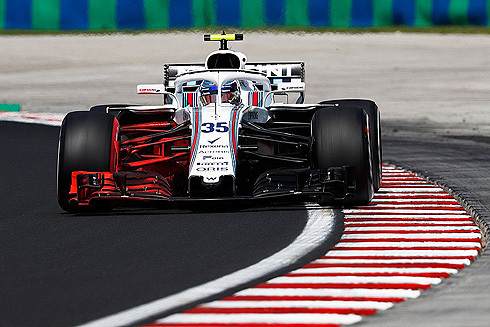 Lance Stroll would finish in 14th while team-mate Sergey Sirotkin was down in a disappointing 19th. But there was only just 0.3 separating the two drivers. The team would continue to run the new front and rear wings as well as the floor but they also had an updated cooling package. Pirelli had brought the medium, soft and ultrasoft for the weekend. With the start of the opening Friday practice drivers would complete installation laps but it would be the Red Bull's of Ricciardo and Verstappen who would set the first times. Ricciardo would go quickest with a 1m:19.556 but Verstappen would move ahead with a 1m:19.280. He would improve with a 1m:19.258 but Raikkonen would go quickest with a 1m:18.762 but he was on the ultrasoft tyre compared to the medium on the Red Bull's. Raikkonen would improve with a 1m:18.710. All three drivers would pit as others started to come out. Alonso and Vandoorne would be fourth and fifth followed by Gasly and Hartley. Hamilton was now third but Bottas would move ahead with the pair both on soft tyres. The order would quickly change as drivers set times with the majority of drivers on soft tyres. Bottas would go quickest with a 1m:18.470 from Raikkonen and Verstappen. Vettel would go quickest with a 1m:18.218 followed by Bottas and Raikkonen. After their first runs the Williams drivers were 16th and 18th while Magnussen would move into ninth. At the front Vettel had improved with a 1m:17.997 as they track emptied as drivers returned to the pits to return their set of Pirelli tyres. Vandoorne would be the first driver to return joined by both Williams. After their first runs the Williams drivers would be 10th and 19th. Both Mercedes cars were back out while Magnussen went eighth on the ultrasoft tyre. Hamilton moved up to second ahead of Bottas using the soft tyre. Hulkenberg and Sainz were 6th and 7th but Hulkenberg would stop out on the side of the track. 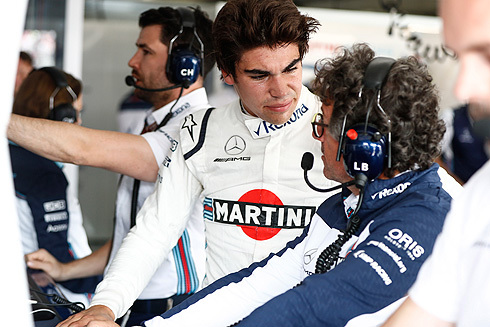 Both Williams cars would pit with just 0.3 separating them from 11th to 19th. Vettel would set a 1m:17.692 on the ultrasoft tyre but Ricciardo would go quickest with a 1m:17.613 running on the soft tyre. Vettel was second followed by Verstappen, Raikkonen, Hamilton, Bottas, Hulkenberg, Sainz, Magnussen and Gasly tenth. Ericsson had spun damaging his floor ending his session. With under ten minutes remaining both Williams drivers were on a long run using the ultrasoft tyre. Using new ultrasoft tyres Grosjean would move up to ninth seeing the Williams drivers no w14th and 19th. The session would end with the Williams drivers remaining in these places with the top ten now Ricciardo, Vettel, Verstappen, Raikkonen, Hamilton, Bottas, Grosjean, Hulkenberg, Sainz and Magnussen tenth. A session that would see the Williams drivers finish several places apart but only 0.3 would be between them in their times. Both drivers had continued to run with the new front and rear wings as well as the floor but they also had a new cooling package. Lance would complete his installation lap running of soft tyres. Lance would return for his first run using the ultrasoft tyres. Lance would set a 1m:22.245 to be 12th fastest and slowest of the times set. Lance would improve with a 1m:20.858 moving into 11th dropping to 13th. A 1m:20.668 was a slight improvement but he would not improve in places currently 15th. He would drop to 17th as he pitted. After a short break Lance would return again on the ultrasoft tyre. Lance would set a 1m:20.012 to move up to 10th. Lance would drop to 11th as he pitted after a ten lap run. Lance would return remaining on the used ultrasoft tyres. Lance had dropped to 13th with under ten minutes remaining. Lance would pit having completed a total of twenty laps on the ultrasoft tyre. Sergey would be first out for Williams for his installation lap running on the medium tyre. Sergey was also back out running also on the ultrasoft tyres and had set 1m:21.173 to be 16th, dropping to 18th. After the break in the session Sergey would return again on the ultrasoft tyre. A 1m:20.711 would see him fail to improve position of 19th. He would improve with a 1m:20.307 but remained 19th. Sergey would pit after a nine lap run. Like his team-mate he would return also staying on used ultrasoft tyres. With the end of the session he would pit having completed a total of eighteen laps on the ultrasoft tyre.